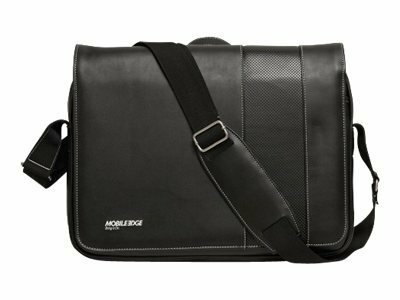 Mobile Edge Slimline Ultrabook Messenger - Notebook carrying case - 14.1" - black/white - for Apple MacBook Air (13.3 in)Tablets and Ultrabooks have created a category of portable computing. The Mobile Edge Slimline Ultrabook cases are perfectly suited to these sleek form factors. They feature a stylish Koskin outer-shell material with contrast stitching and perforated accent panels. The Slimline Messenger has padded pockets for both a 14.1" Ultrabook and an iPad or other popular tablet. There is additional space for files and accessories, an interior zippered pocket, a full-length exterior pocket plus an organizer for cell-phones, iPod, flash drives, memory cards, pens and a key fob. An adjustable shoulder strap with polished nickel fittings make the case easy to carry. If you have any questions about this product by Mobile Edge, contact us by completing and submitting the form below. If you are looking for a specif part number, please include it with your message.